Mayfield Golf Course is just 1 mile from this Pennsylvania hotel, which features an indoor heated pool and gym. A 32-inch flat-screen cable TV with HBO is offered in every room at Hampton Inn Clarion. Free Wi-Fi and a coffee maker are included in the contemporary rooms. Decorated with dark wood furniture, each room also has a desk. Rooms with a sofa bed, microwave and fridge are available. Guests can enjoy a daily hot breakfast buffet. They can also enjoy free newspapers and use the business center. Clarion Hampton Inn is next to Clarion Hospital. It is within 4 miles of Clarion University of Pennsylvania and Clarion County Park and a 21-minute drive from A-Maze-Ing Farm Adventure. 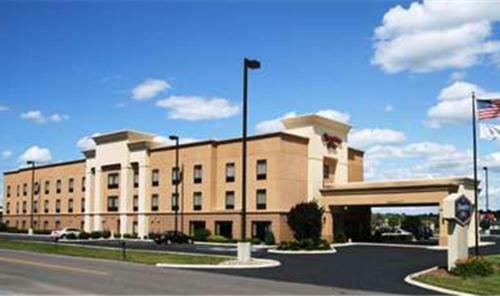 the hotel Hampton Inn Clarion so we can give you detailed rates for the rooms in the desired period.